Compiling your Christmas wish list? Add an oversized men's watch to it (if you haven't got one already). 'A great watch can update any outfit and be sporty, luxurious and utilitarian all at the same time,' say Michael Kors, the American designer who does a timepiece very well. Take my word for it. His rose-gold ladies chronograph watch is the best and most constant accessory I wear each day. It just completes every – and any – outfit effortlessly. That's the appeal of the oversized men's watch: it's become a classic. And, what makes Michael Kors the go-to brand is the fact his watches are well made and affordable, yet look luxurious and expensive. It's partly down to the metals. I spent ages in Time² watches trying on designs in gold, rose-gold and silver (the shop assistants were ever so helpful – and patient!). In the end, I think my decision was secretly influenced by David Beckham, who bought wife Victoria a rose-gold Daytona Rolex for her 36th birthday last year (which, in turn, inspired the gorgeous Brian Atwood rose-gold platform pumps she used in her s/s 2011 collection). So there you have it, my Michael Kors watch is the bargainista version of Posh's Rolex! Sure, £199 may not sound cheap, but this isn't a piece of throwaway fashion we're talking about here. On style and quality alone, it's great value for money – even more so given it looks far more expensive than it is. And, as it's something I'll wear for years to come, the cost per wear argument is easily won. Which Michael Kors watch would you choose? Gold, rose-gold or silver? Let me know. I have a tendency to get the bigger one (your model) but the feedback on Amazon etc. is not so positive, a lot of people say that the color fades quickly. Would you mind adding some other pictures of the watch? I've asked for one for Christmas already :) Fingers crossed Santa was listening! Totally agree - MK is the best watch brand in the world. Hi Bargainista!! 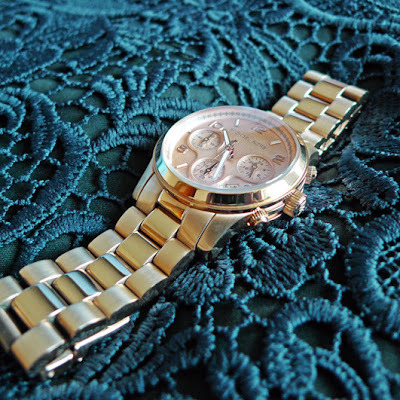 I love this watch, posted it as a fav last week on my blog too! :-D I have a rolex but I love this watch so much!! :-) Adding it to my wishlist! You have such a pretty blog! Christmas Giveaway (you are obviously invited): !!! I think Michael Kors do great classic basics - I have a MK leather jacket that I adore, and also a rose gold watch (very similar to yours but without the additional dials) that I wear every day. They're a favourite brand of mine. Ohhh I want one so bad - preferable in rose gold... but i'm not fussy! melovebutterflies, sorry I've not had time to post any pictures but I hope you've been able to decide which model to get. Personally, I think the bigger version makes more of a statement. It's masculine yet elegant, strong yet sophisticated. I've not had a problem with the colour fading and wouldn't expect it to from a watch of this quality. Of course, it all comes down to how well the watch is treated and what conditions it's worn in. Take good care of it and it should last and last. Kate, roll on Christmas Day! Hope Santa delivers. And lucky you, Anneli, Christmas came early! Wow, Anna, a Rolex and now, hopefully a Michael Kors watch for Christmas? I'm jealous! I agree Jen. Michael Kors does a good wardrobe as well as watches. Victoria'sProcrastinationProject, ask Santa now! Or keep an eye out in the sales. I think Time² already has some Michael Kors watches in the sale. After wanting the Gold MK5055 for some time now (years, yes years) I am treating myself on pay day! cant wait! I have succumed to the peer pressure in my office I'm afraid to say! EVERY girl has one! Happy Christmas, love Bargainista Fashionista! 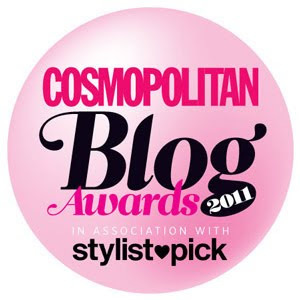 Win Burt's Bees beauty products! New Look's bird-print tea dress – at last! Win a Bare Minerals Get Started Kit!